Members of Wealthy Saudi Family Emerge As Clinton Foundation and Democrat Donors - Stumpin' For Trump! A wealthy family closely aligned with Saudi Arabia’s ruling family has emerged as a key donor to both the Clinton Foundation and prominent Democrats, despite the clan’s involvement in a domestic violence case that it has sought to sweep under the rug, according to police reports and funding documents viewed by the Washington Free Beacon. Nasser al-Rashid, one of Saudi Arabia’s wealthiest figures and an adviser to the country’s royal family, has donated somewhere between $1 million to $5 million to the Clinton Foundation, putting him in an elite category of prominent donors. Al-Rashid’s children—including one who pled guilty to assaulting his estranged wife—have poured almost $600,000 into Democratic coffers during the past several years, raising questions about influence peddling by prominent foreign families. The controversy has already rippled through Florida’s contentious race for a Democratic Senate seat and threatens to further entangle presidential contender Hillary Clinton, who has already faced questions about her close ties to foreign governments. “This raises a very simple question in my mind—why is this family of one of Saudi Arabia’s richest billionaires and a key adviser to the royal family pouring hundreds of thousands of dollars into our political system to elect and influence these Democrats?” asked Ian Prior, a longtime Republican political operative and current spokesman for the Senate Leadership Fund, which advocates the election of Republican candidates. Nasser Ibrahim al-Rashid, the family’s patriarch, is the founder and chairman of the Riyadh-based Rashid Engineering, making him one of the country’s top five wealthiest men. His high-dollar donations to the Clinton Foundation put him in league with other prominent donors such as financial giant Barclays Capital and beer magnate Anheuser-Busch. Donations by foreign governments, including Saudi Arabia, to the Clinton Foundation have sparked multiple reports questioning Hillary Clinton’s close relationship with these nations. Al-Rashid’s three sons have followed in their father’s political footsteps, contributing large sums to top Democrats, including Rep. Patrick Murphy (D., Fla.), whose Senate race could help decide which party controls the Senate in 2017. 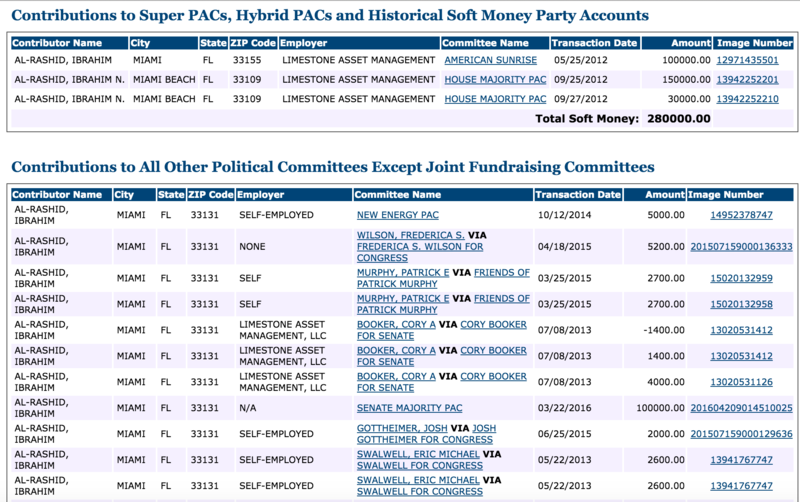 Murphy has already returned a portion of al-Rashid’s donations due to his involvement in a domestic assault incident. Ibrahim al-Rashid allegedly forced his way into his estranged wife’s Pennsylvania home, where al-Rashid allegedly “grabbed her by the wrist, struck her about the head and face with a closed fist then threw her to the ground,” according to a copy of the police report viewed by the Free Beacon. Following the 2014 incident, al-Rashid allegedly sent his wife a text message stating, “I am not sorry this time I hope you die in hell,” according to the police report. Murphy, a longtime friend of al-Rashid, was recently forced to donate around $16,000 in campaign funds to domestic violence groups after the assault charge became a public liability for the campaign. 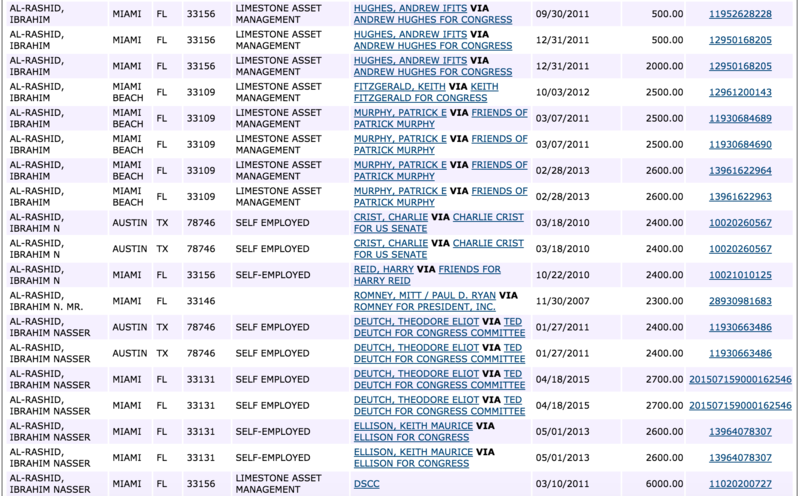 Murphy also returned all of the donations made by al-Rashid during the last three political cycles. 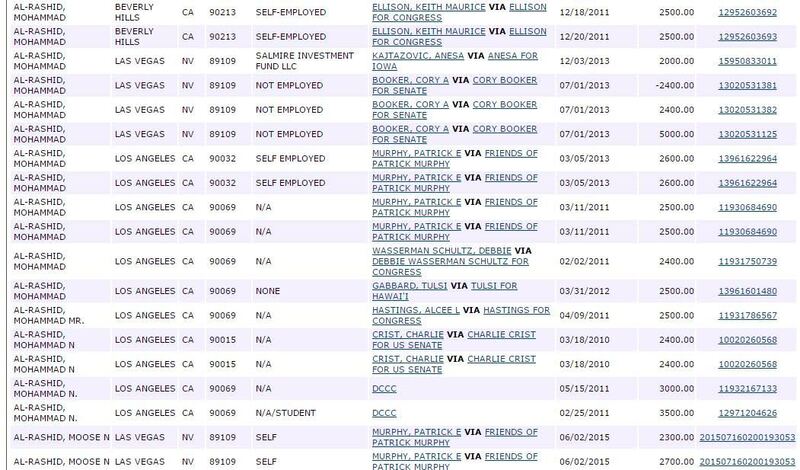 However, that did not account for all of the money al-Rashid donated in 2012 to a pro-Murphy Super PAC, prompting calls for Murphy to return that money as well. Al-Rashid has donated at least $490,000 mainly to Democratic campaigns, the Democratic Congressional Campaign Committee, and Democratic Super PACs, according to funding data, raising further questions about whether these candidates and organizations also will return the controversial cash. When reached at his home for comment about these donations, al-Rashid declined to answer questions, requesting that the reporter who called respect his privacy. Al-Rashid did admit that he was aware of reports detailing the controversy over his donations to Murphy. 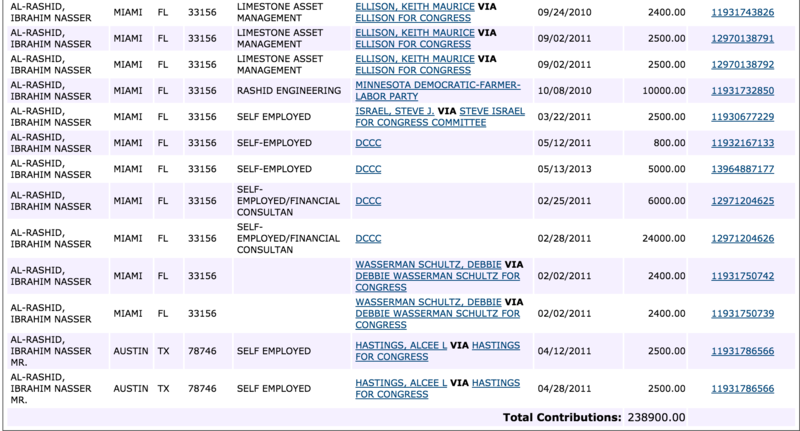 Ibrahim’s brother, Salman al-Rashid, also has sunk at least $57,600 into Democratic campaigns, including the DCCC. This includes contributions to the campaigns of Murphy and Sen. Cory Booker (D., N.J.), as well as Rep. Ted Deutch (D., Fla.), Rep. Keith Ellison (D., Minn.), and Sen. Kirsten Gillibrand (D., N.Y.), among others, according to Federal Election Commission data. 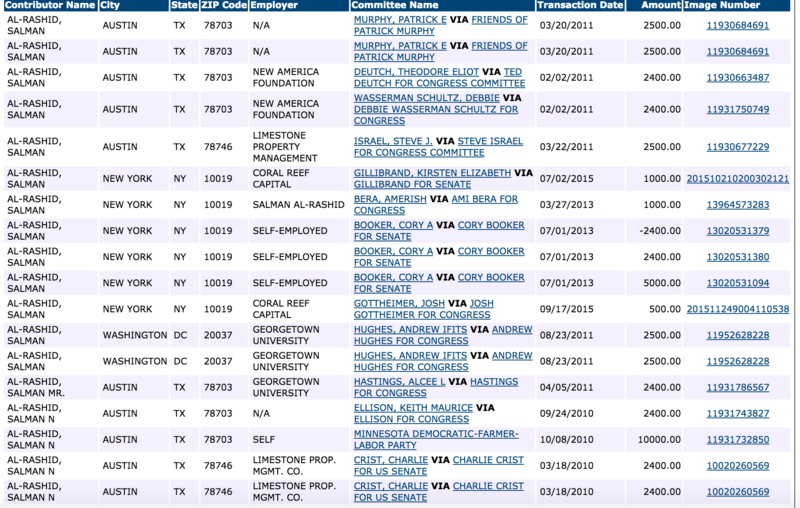 A third son of Nasser, Mohammed al-Rashid, appears to have donated around $40,000 mainly to Democrats, according to FEC data. This includes donations to the DCCC, Murphy, Ellison, Booker, and Rep. Debbie Wasserman Schultz (D., Fla.), among others, according to the FEC. One veteran political operative who has been tracking the 2016 election cycle told the Free Beaconthat these donations raise questions about foreign influence in U.S. politics. Attempts to reach Salman and Mohammad al-Rashid for comment were unsuccessful. This recent revelation is nothing new for the Clintons. In August 2013, the New York Times published an investigative report that the Clinton Foundation, listed as a non-profit organization, collected over $492 million from 1997 to 2007. In 2007 and 2008, the Foundation ran a $40 million deficit. In 2012, it ran a deficit of over $8 million despite the Foundation and two subsidiaries generating $214 million in revenues. According to the report,much of that money came from foreign governments like Saudi Arabia, Kuwait, Qatar, Brunei, and Oman. No one donates this kind of money for no reason nor do they expect nothing. CF is a joke.